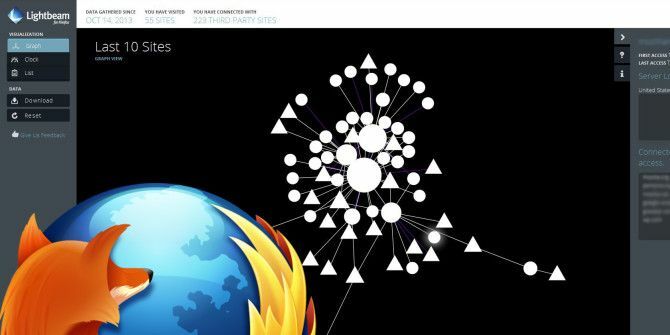 Mozilla has announced a new add-on for Firefox called Lightbeam that allows users to see exactly how they are being tracked while they surf the Web. The add-on works by recording what websites you visit and what third-parties are connected to those websites, and then displaying that information in a visually appealing and digestible format. Lightbeam offers three modes for visualizing this information: graph, clock, and list. Graph allows each website’s logo to float around freely with the third-parties floating around it, attached by lines; clock shows how many different services the user connected to at any given time by stacking dots on top of a circular clock; and list is a basic list with the information for the websites. In anticipation of user’s worrying that Lightbeam itself will track them, Mozilla has included a “Contribute Data” toggle in the top-right corner of Lightbeam’s interface. If on, Lightbeam will contribute your computer’s browsing information to the crowd-sourced data that Mozilla uses to improve its products, but if off, Lightbeam doesn’t send any information to Mozilla. Lightbeam started off as Collusion, but recently received the renaming during its official overhaul and unveiling. It was created with the help of the non-profit Ford Foundation, the Natural Sciences and Engineering Research Council (NSERC), and students at the Social + Interactive Media (SIM) Centre at Emily Carr University of Art + Design. What do you think of Lightbeam? Which other tools do you use to see who’s tracking you? Let us know in the comments. Explore more about: Mozilla Firefox, Online Security. "Mozilla has included a “Contribute Data” toggle in the top-right corner of Lightbeam’s interface." Glad Mozilla's doing something, anyway. What good is visualizing who's tracking you when there's nothing you can do about? Here's what I do. Never, ever, never visit a website without Adblock Plus and NoScript installed in my browser and also using MVPS hosts file. Whenever I visit a site I always view the source code for third party domains and block them. Google is top on the list of things that track me.